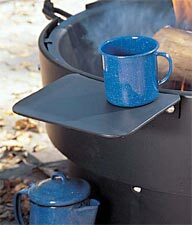 This campfire ring features a flat rear panel so wheelchairs can have closer access to the cooking grate and adjustment handles. The 300 sq. inch cooking grate adjusts to 4 levels between 19" and 24" above the ground. 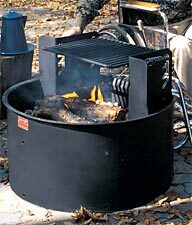 This fire ring design allows the grate to be adjusted one side at a time, using only one hand; without tight grasping, pinching or twisting of the wrist; and does not exceed 10 lb. to lift. 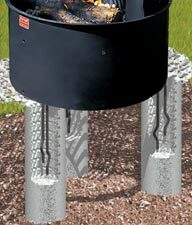 The ring is filled with aggregate (not included) to about 10-1/2" deep to provide the elevated fire surface. This fill also insulates the ground to reduce the chance of root fires in heavily wooded areas. Drain/draft holes are provided around the perimeter of the fire ring.